Enough of Hello Kitty hogging all the spotlight to date – how about good old Snoopy? Everyone’s favorite Beagle is now available as a plush phone strap from Strapya World. You can choose from a variety of designs depicting Snoopy in different get ups and colors. Even for the fussy types, there are bound to be at least one design which will suit your taste. Prices range from $3.60 to $8.10, depending on the design and size. One problem with plush cellphone straps would be the ease of them getting soiled via daily use – something that doesn’t plague plastics. I’m so there – my wife is a huge anime/Hello Kitty fan. I’m all for snoopy – or heck, Hagar the Horrible plushies. where I’ld looking for attach? how to get one of those? or howto order? 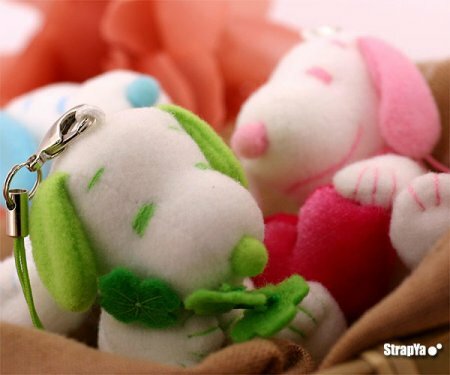 how if want to order this snoopy..? ?